Slot Rules show shoppers different offers, personalized for them, because presenting contextually relevant content increases sales. SmartBlocks are what Fresh Relevance calls the blocks of real-time, personalized content that you design to engage customers and build their journey, and Slot Rules select which one gets displayed. SmartBlocks can be used in your web pages and emails alike - and in both cases we render and personalize them in real-time, so your marketing is always up-to-the-minute. When the page or email is viewed, FreshRelevance loads the SmartBlock into the slot, personalized and in real-time. You have full control and can change what's displayed in the slot, by editing its Slot Rules (marketing rules). 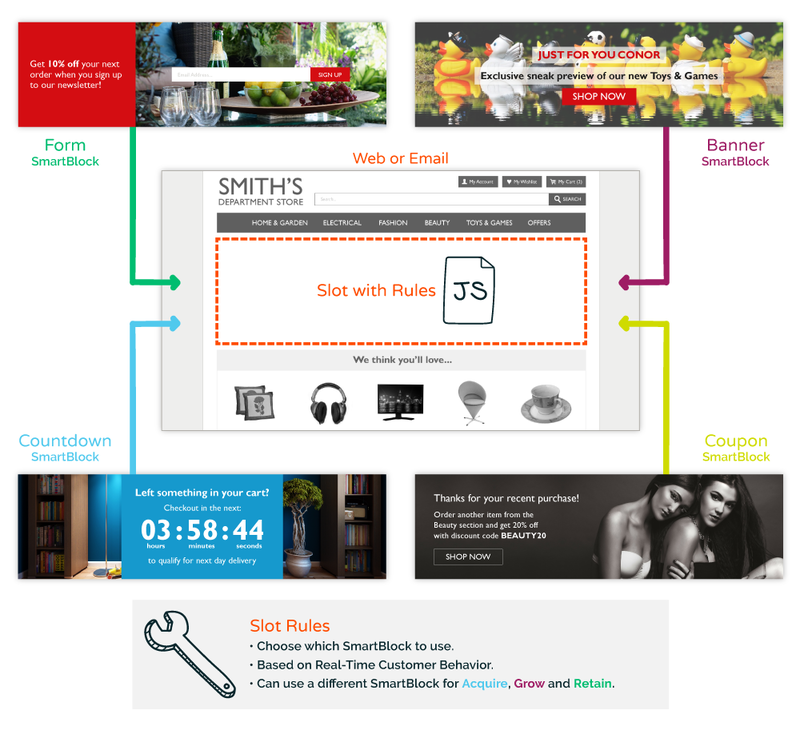 Slot Rules can show different SmartBlocks for different types of shopper, time/date range, brand of product already on the page etc. This works rather similar to ad serving. The other important thing to realize is that you can change our Slot Rules at any time - changing the content even after an email has been sent, which can be a life-saver if e.g. you've made an error, or the main product that you're promoting goes out-of-stock. Alternatively we can do any part of this as a paid service, if you wish, and our support and services guys are very good. You use 40+ drag-and-drop rules to decide which SmartBlock shows in each slot. These drag-and-drop Slot Rules select SmartBlocks based on: Within time period/date period, Current Product Page, Category of Product on Page, Site Brand of Current Page, Identified, Not Identified, New Buyer, Recent Purchaser, Recent Purchase Value, Number of Products Viewed, Best Category, Last Cart Value, Has Browsed Category, Has Carted Category, Has Purchased Category, Top Buyer, and a lot more. Rules can be used separately or combined together. Custom - everything else, including script to dynamically modify your web page or menus.